Flygsfors Flamingo by Viktor Berndt. Signed: "Flamingo" and "Flygsfors -58". Artist: Viktor Berndt (not Paul Kedelv). it seems to be the same glass piece as in modernistglass.com. 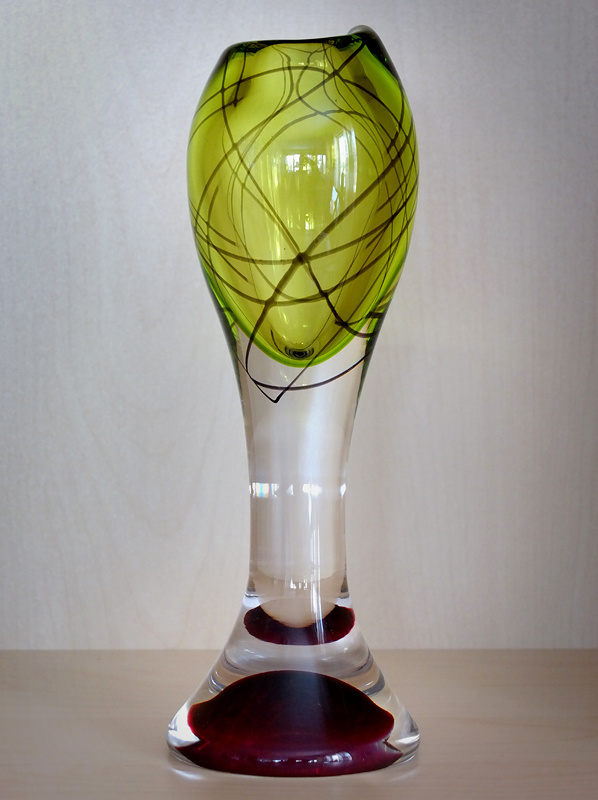 The owner of this glass had bought it in the belief that it was a vase by Vicke Lindstrand at Kosta, it was in fact signed "Kosta" and a number of unique Lindstrand glass, but glass expert Borje Akerblom notes that the signature is false. The glass is from Flygsfors according to documents over the production and drawings. When the same vase appear on modernistglass.com, most of the signature cut away. However, there are some numbers remain as they are confused about. No wonder of that, they're false and has nothing to do with the glass original. 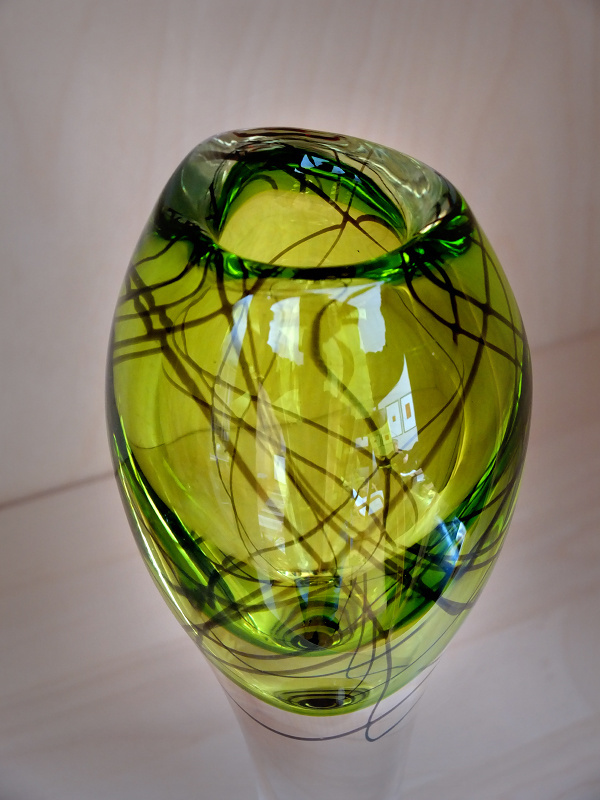 They are remnants of a false LU-number (LU-number = Lindstrand Kosta unique glass) and are not on the lists of his unique pieces from Kosta. The vase I show here have a proper signing and should therefore also be more sought after in the collectors market. However, I was a bit worried before I got the vase, the seller had stated that it was signed Flygsfors -50. But it turned out to be the number 8 and not zero, Flygsfors 1958 is the true signature. Otherwise it would have been another mystery to resolve. This particular type of Flamingo does not seem to be as common as some other Flygsfors Glass. Coquille-glasses by Kedelv for example is significantly more common in the market. Flygsfors made otherwise most glass for lighting fixtures and was in its time the largest producer in Europe of that kind of glass. The number of employees were at most 240, while about 280 people were working at nearby Orrefors Glassworks. Just two kilometers differ between the two production units in Orrefors and Flygsfors. Flygsfors was bought by Orrefors in 1975, and in August 1979 they closed down for good. Orrefors had done the same with Strombergshyttan. After bankruptcy in 1976, the large producer bought the little, but in June 1979 closed my father, Putte Bergqvist, the fuel tap to the ovens in Strombergshyttan. After that, Orrefors resumed production of 115 (!!!) models from Strombergshyttan, now in clear Orrefors crystal. Some designed by Gerda Stromberg in the 1930s. The most distasteful in this is that Orrefors presented the Stromberg models as news. Today is also Orrefors closed. The historic Glassworks was shut down last year by the owner New Wave Group. Whether Orrefors after the demise of Flygsfors in 1979, also took up the models from there in their own production, I do not know. This fake signature is "Kosta" and a "LH1144", also a Lindstrand number, but now not in LU (unique pieces). LH is series production. One may wonder how the experts at SAV could be so wrong? They have not even placed the Lindstrand number in the right decade. LH 1144 belongs to the middle of the 1950s, not the 1960s as the experts on SAV says. But in the catalog from Kosta of 1955/56 this number is missing . There is a break in the series between the LH1142 and LH 1145. Maybe a smart choice to select a number of missing? You can then easily believe this is something produced in small numbers, and which can not be proven to be false by another glass already exists with that number and with different look. 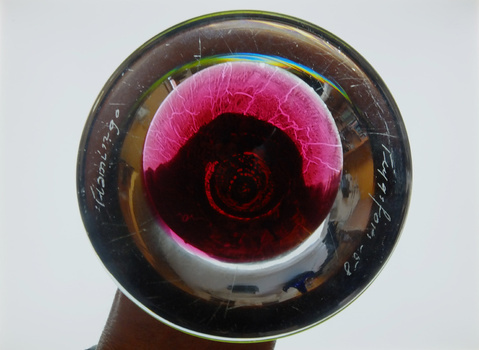 Borje Akerblom has already stated in the forum at precisensan.com that Kosta and Lindstrand are fake and false for this model, according to catalogs and drawings from Flygsfors about this Flamingo model, so it's easy to deny even this glass in the SAV-auction as a Lindstrand-piece. 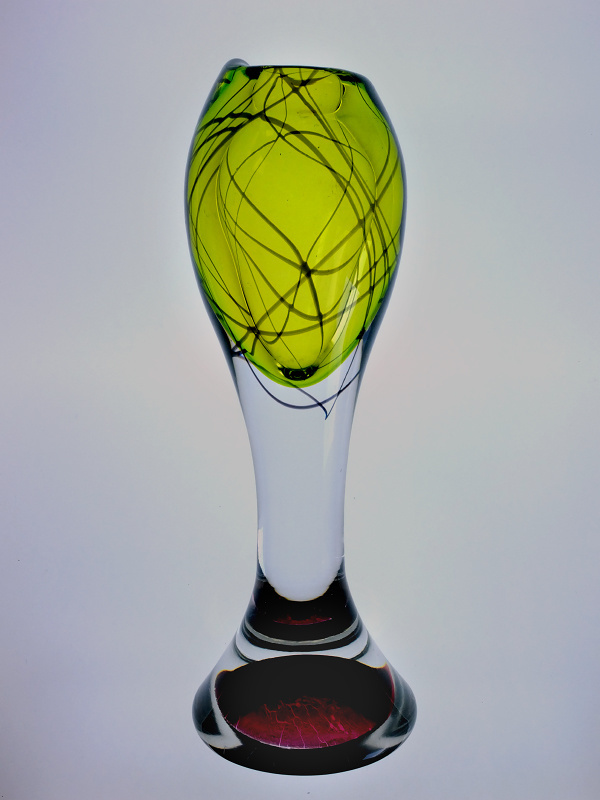 Also this glass has a signature that is a forgery, which unfortunately makes the vase far less worth in the market. Maybe it's the same person who did this, and maybe are more pieces of this Flamingo model false signed? Personally I'm glad to have a Flamingo of this model that seems to have a genuine signature and are not prepared retrospectively by bunglers. You are a detective. And what a beautiful piece.